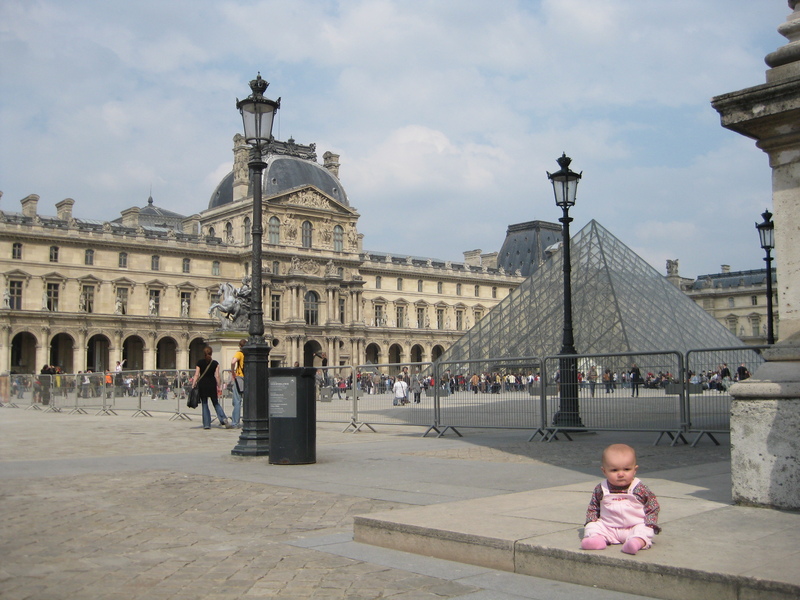 Infants will enjoy the Louvre. More specifically they will enjoy the colorful, quadfold Louvre brochure. It’s tasty. We were so engrossed in people-watching and admiring the art – though when the halls are packed the variety of people is almost more engrossing than the masterpieces – we didn’t realize our seven-month-old was eating the brochure until nearly an entire page was digested. Well, I exaggerate. Although if I remember correctly, various shades of blue, black and red were covering her lips and tongue. I am fairly certain museum brochures are not printed with infant-friendly, non-toxic ink. Note to self. The Louvre was packed because it’s the Louvre – and because it’s free the first Sunday of every month! We don’t rush art museums. If a museum is too vast to explore in its entirety within a few hours, we pick a section to focus on and save the rest for another visit in another decade – perhaps without children. Of course, an infant that enjoys relaxing in the stroller and people-watching (or brochure munching) has the right temperament for an art museum. We were blessed in that regard with our oldest daughter. We are also fortunate that she is not a picky eater – hence the reason she ate the brochure. Or perhaps it was just time for lunch. Our lunch experience at the Louvre took place at the restaurant in the Richelieu wing. They provided a highchair and a table by the window on the second floor with an expansive view of the courtyard Pyramid. Feeding an infant on the go can seem tricky. But in France, there’s always something on the menu a baby will eat. Namely, the ubiquitous cheese board. Why feed your baby cut up pieces of processed string cheese and goldfish crackers (which I might not have found in France anyway, had I looked) when they can eat cubes of gouda, small morsels of fresh bread and pieces of grape? And you don’t have to feel guilty about ordering in excess of what you would normally order because “it’s for the baby.” Make sure you snack on it while you wait for your soup, which you can also feed the baby. Then gear up to face the pack of museum crawlers after lunch, when with any luck baby will be happily napping in the stroller dreaming of Emmental and the Winged Victory of Samothrace. I can just SEE you there! This great, Heidi! And it really makes me miss Lil P – and her lil sis.